the subway runs 24 hours, so you can do it whenever you want! BOTTOM LINE: Three site-specific audio plays in New York City's subway. Normally I take the subway to the theater and then turn off my cell phone before the show. Attending one of the Subway Plays is completely different: my Metro Card serves as a “ticket” and my cell phone basically provides the experience. The beauty of Subway Plays is that you can “attend” at any time, night or day. 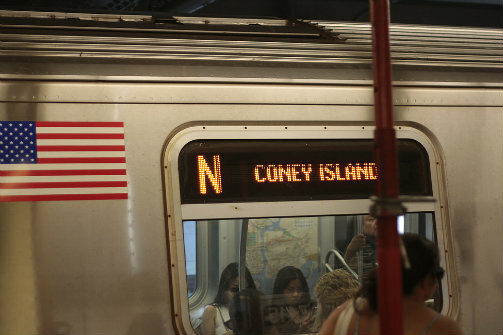 And you can start at either end of the designated route, since each play consists of two tracks—“To Queens” (or Brooklyn) and “To Manhattan.” You simply take a local train (not express) and listen to the corresponding track. Each act is under 25 minutes; the entire play should take you about an hour (if there are no delays). To avoid rush hour I take a Queens-bound 7 at 10 am from Times Square. As the doors close, I take a seat, put the headphones on, and hit play. On my way to Queens and then back to Manhattan I listen to bits and pieces of several dialogues. Some of the characters travel together and discover something in each other along the way. Others are brought together by the commute and suddenly find a genuine human connection. Immigrants, travelers, lovers, local historians, or artists might sit or stand right next to you and you won’t even know this. But with Subway Plays, your phone gives you the super power to “overhear” conversations in the car and follow the lives of everyday people, at least for the duration of your ride. I am in love with the concept more than the execution. As soon as I start the track, I immediately hear that the rattle of the train wheels on the recording competes with the sounds of the actual subway car. To my disappointment, the sound effect never goes away, only fading when the dialogue is heard. I wonder why sound designer Natalie Johnsonius Neubert did this, especially since the play is intended to be site-specific. It is especially disorienting when the car stops...but the sound of it running continues. The recording is binaural, meaning that sometimes you hear people talking in your right ear, and other times in your left ear, for a closer resemblance to real life. As the characters discuss other passengers on the train, you often can’t help but look around to assign those characteristics to the people riding with you; the passers-by in the fabric of the narration almost seem to exist right in front of you. These moments, where the play reaches out to your present reality, are probably the most powerful. As for the specifics of The International Local, a tapestry of languages is heard throughout, embodying the concept of New York as an international city. This is especially fitting for the route the 7 train takes—right through Queens, said to be the part of New York (and indeed, the world) with the most languages spoken. There is a sketch artist, a couple that role-plays “strangers on the train,” a Spanish-speaking woman who tries not to fall asleep, and many more. Several of the conversations are endearing, like the one between a Chinese woman and her grandson in which she discovers video games for herself. At times the dialogue is informative, even referencing objects en route, like the stained glass windows at the 40th Street station. If the timing with these moments is a little off, that's to be expected, since it is near impossible to time a subway with any precision. I was sold on the synopsis, and I really wanted to like Subway Plays. But at least in The International Local, the various dialogues never stop; sometimes they even overlap. The density of recorded voices can get a little too thick, and the overall point of the content isn't always clear. While The International Local tackles some important topics, like the perception of immigrants or breast-feeding in public places, it doesn’t provide many insightful observations. Nor does it draw three-dimensional characters. It mostly resembles an exercise in comprehensive listening. Of course in 2017, that in itself may be something we all need to do a little bit more of. Subway Plays are conceived and directed by Erin B. Mee. Written by Jenny Lyn Bader (The International Local Trail: 7), Jessie Bear (Damper Felts: N), and Colin Waitt (Spare Some Change: L). Sound Designed by Natalie Johnsonius Neubert. Stage Managed by Sophia Cohen Smith. The cast is Mariana Cardenas, Tina Chen, Yadira Correa, Nick Fondulis, Lindsley Howard, Toussaint Jeanlouis, Anouschka Joshi, Jed Peterson, Leila Satyanath-Mee, Xiaozhou Xu, Caitlin Naseema Cassidy, Ashley Wren Collins, Andrea Egerton, Greg Engbrecht, Anna Frankly-Duval, Caitlin Goldie, Niki Hatzidis, Amir Khafagy, Alesandra Nahodil, Beth Dodye Bass, Adam Boncz, Kaylin Lee Clinton, Emily Cordes, A.J. Ditty, Christopher Gergis, Nicole Gentile, Emily Karause, Kineta Kunutu, Athena Lamarrre, Caiti Lattimer, Hayward Leach, Cristina Pitter, Tressa Preston, Gianmarco Soresi, Russell Sperberg, Matt Stango, Jennifer Tsay, Colin Waitt, Ratnesh Dubey, and Sarah M. White.